A new report from JSI discusses findings from emerging accountable care organizations (ACOs) in the safety net. ACOs consisting of multiple health centers or health center networks have formed in several places, yet many health centers have not participated in or led ACOs for a variety of reasons, including lack of startup capital and lack of experience collaborating with hospitals in sharing financial risk. Nevertheless, health centers are increasingly interested in pursuing accountable care strategies to improve cost and quality outcomes for the individuals they serve. Health centers are well positioned to participate actively in accountable care payment and delivery system reforms. Health Centers in the Era of Accountable Care: Insights from AltaMed Health Services, is the second in a series of white papers examining trends in development and growth among emerging safety-net ACOs over the past two years supported by the Robert Wood Johnson Foundation. Our analysis draws examples from our research on safety-net ACOs nationally as well as from three site visits and 25 interviews with leaders at AltaMed Health Care Services based in Los Angeles, CA. AltaMed is the nation’s largest federally-qualified health center (FQHC) and an independent practice association (IPA) serving Los Angeles and Orange Counties, with approximately 147,000 MediCal patients an increasing portion enrolled in risk-based contracts. AltaMed’s transformation from a single health center into a virtual ACO competing with other large provider groups is interesting to study because of its size, growth, and experience with financial risk. benefit from assuming financial risk incrementally. 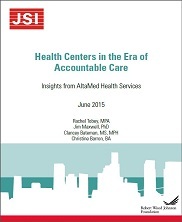 We also address how leadership and size can serve as key facilitators for health centers participating in and succeeding under accountable care. Rooted in community-based leadership and a mission to advance community health, we explore how health centers can be a fulcrum of accountable care in the safety-net by delivering cost-effective, whole-person care and working with partners to improve the health of underserved communities.